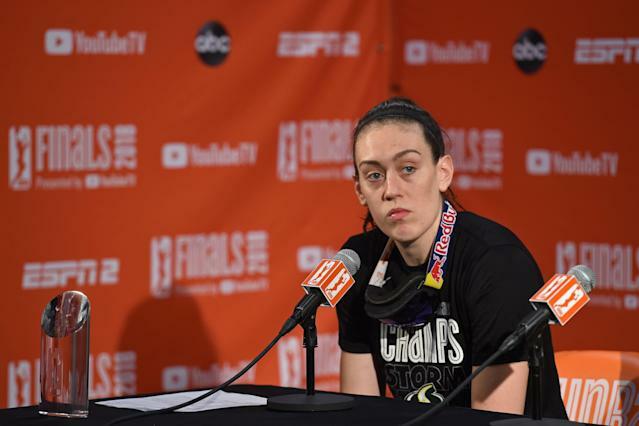 Breanna Stewart has come into her own as a millennial on top of the women’s basketball world. She crushed it in college, is piling it on in professional leagues and is taking on an activist role. This week her aim is at the NCAA and what she calls a lack of respect for the women’s game as compared to the men’s. Her ire is shared by many during a pause between the first two rounds and the Sweet 16, exemplifying how far there is to go and what simple things society can do to change the tides. Stewart is the WNBA’s reigning MVP and a 2018 champion with the Seattle Storm. The 24-year-old’s accolades already take up a short novel and include four national titles with the University of Connecticut, all of which came with Final Four Outstanding Player awards. Well-versed in the differences in coverage at the collegiate level for men and women, she joined in Wednesday morning in sharing thoughts on a post by the NCAA March Madness Twitter handle. The post is from Monday, the first day without men’s games since the tournament began, and references “March Madness” games. The women’s tournament was still in the second round that night and two 6-seeds pulled off victories in tight games that finished within minutes of each other. Stewart’s point is that there were still March Madness games going on, but for those going by the tweet it seemed as if action was over until Thursday across the board. The account, NCAA March Madness, is described in its bio as all things “Division I men’s basketball.” It forces the women’s page to go with NCAA WBB. And herein lies the issue Stewart voiced. While many forcibly told her “March Madness” is a term for men’s basketball, according to a Time story updated this month, it’s actually not. The blanket term was first used for boys basketball in Illinois, per the story, and taken on years later when calling the men’s tournament. So, a lot of people are pointing out that this is from the men’s account. That makes some sense in the micro. The macro issue is that the NCAA defaults all basketball/tournament/March madness lingo to men unless specified otherwise. There’s no reason March Madness should not be a blanket phrase for NCAA basketball tournaments given as Stewart mentions it is gender neutral. Marketing it that way would only help the sport and give the women’s side the respect it deserves but it so often lacks, even from its own governing body. There is a simple solution: reference that the women are still playing. It’s all under one umbrella, the NCAA. This one aspect is far from the only issue bubbling for women’s basketball players. There is not nearly enough time or words allowed in a post to exemplify all the slight ways society leaves women out of the conversation. That was clear when Murray State star Ja Morant began the men’s tournament with a triple-double while Oregon sensation Sabrina Ionescu went inexplicably ignored in the conversation. Her Instagram clapback may have won the week, but it only came about because of the slights constantly handed to women. For all of the things people say to knock the women’s game such as lack of dunks and parity — and that conversation constantly shifts in order to stay in the argument — very few actually hold up. This year’s women’s tournament has been more chaotic than the men’s, beginning with the three overtime games so far and a slew of tightly contested match-ups. All four 1, 2 and 3-seeds have moved on in the men’s tournament. Joining them are two 4-seeds, one 5 and one 12. All four 1 and 2-seeds made it through on the women’s side. They’re joined by only one 3-seed, three 4-seeds, one 5, two 6-seeds and an 11. What can be done about the gender divide? It’s easy to pinpoint problems, yet few follow up with solutions. In this case, though, there is a lot of simple tweaks that will help even out the field. The first is to call the tournaments what they each are, whether that be in headlines, in Twitter handles, in rural newspaper agate or in the bar with friends. It is the “men’s tournament” and the “women’s tournament.” That’s the respect aspect Stewart is referencing. Katie Barnes, espnW’s sports and culture writer, was asked by a follower what they believe the secondary factors are in the women’s basketball hate. Their thoughts are shared by most in the women’s sports world, most notably Minnesota Lynx head coach Cheryl Reeve. A lot of things are going on, imo. So ESPN is the only network that gives any space for the women's tournament, whereas every mainstream sports outlet, regardless of rights, is pushing analysis, discussion, and highlights of the men's tournament. It’s easy to care about things we know about. Certainly basketball fans watch Duke and Zion Williamson because it’s Duke and Zion Williamson. They also watch because the constant coverage tells them it’s important and they should be watching. Media entities aren’t showcasing the women’s game the way they should. Instead the coverage is shallow and hidden. If they did proper coverage, Buffalo almost taking out UConn (Stewie’s alma mater) in the second round would be a huge talking point since it put the Huskies’ streak of Final Four berths in jeopardy. For those who watched Syracuse (Stewie’s hometown team) and Baylor go shot-for-shot behind the arc on the men’s side in round 1, hopefully they watched the Orange women do the same with South Dakota State in a 6-over-3 result that went down to the wire in the second round. Minutes later another 6-seed moved into the Sweet 16 when UCLA knocked off Maryland in overtime. The tournament is also so much more than what's happening on the court. It's about the brackets and the Madness, so to speak. Other than ESPN, I don't think anyone does a women's bracket fantasy challenge. That really hurts the women's tournament in many ways. Building a bracket is at least half the fun of March. We live by the them, proven by the “bracket busted” headlines and social posts. A large portion of these brackets involve winning money. If building a bracket is a top aspect of March, which we’ve determined to be true, it shouldn’t matter if it’s for men’s or women’s. So why don’t places offer women’s fantasy brackets? Then there’s this: the common phrase this time of year is that women’s basketball is completely predictable. There is no parity, detractors say. If we take that as truth, more people should want to make women’s brackets and make money off of it. Less people talking about it. Less people engaging with the games. I think if more outlets across sports media participate in hyping the women's tournament, there would be an increase in ratings and interest. Humans go to a restaurant because they hear it’s good. They turn on that hit TV show because it has all the commercials and dominates social media. The acronym of the age is FOMO (fear of missing out) so if something is played up enough, people will tune in. The idea transfers to women’s sports. Asking for equality is asking to share the ice cream — or whatever the vice may be — and for those with the larger portion the ask is difficult. Asking for equality is not outrage and taking the early steps to reach it doesn’t require much.